Some of the most sought after tattoos today are Viking tattoo designs that are mythically believed to hail from the ancient Norse mythology and culture. 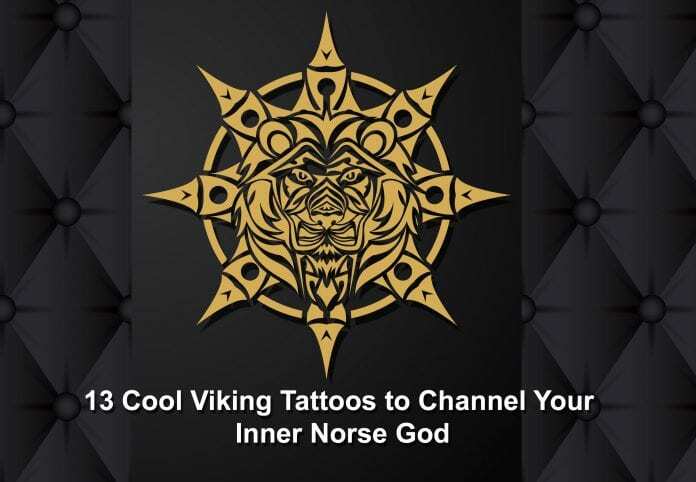 The Vikings, who are characterized as extremely rough, unruly and brave, have inspired very intricate and mysterious tattoo designs worn by my many people today. The groups of warriors who originated from Scandinavian soils like present-day Norway and Sweden are believed to have worn nordic tattoos with symbols and patterns drawn from Norse mythology and other ancient drawings present in their art, carvings, and jewelry. Today, centuries after the Viking Age, their mysteriously interesting culture thrives. With multiple Viking era based films and movies hitting our screens to thousands of people inking themselves with Viking tattoos designs each year. Let’s take a look at some of the most popular modern Viking tattoos and their inspiration in order to better understand the subject. Here are 13 cool Viking tattoos from the web that are both badass and beautiful. This first tattoo throws us right in the middle of the Nordic symbol culture. Aegishjalmur pronounced as ”Eye-gish-hiowlm-er” translates to The Helm of Awe or Terror. Believed to be the most powerful symbol in Norse mythology, the symbol signifies protection. The Helm of Awe also known as the circle of protection is basically a round circle surrounded by eight equal runes that meet precisely at the center. The Vikings believed that wearing the Aegishjalmur would protect them from death while in battle and so they would paint it on their foreheads and arms before going to war. It is today worn for the same reason of protection as well as its symmetrical appearance. Although modern Viking tattoo designs of Odin’s twin ravens has diversified, the basic elements of the symbol are two ravens perched on twigs near a throne. Norse mythology believes that Odin used these ravens to gather information as they flew all over the earth. Huginn represented Odin’s thought while Muninn symbolizes his memory. The symbol is believed to have projected Odin’s consciousness and awareness. It’s a unique tattoo symbol that looks perfect on the chest or back. This is only a modern-day fabrication and depiction of the mighty king ruler of the Vikings; Odin wielding a broad sword as if to pierce something beneath him. The one-eyed demi-god is the Viking’s ultimate representation of power and respect. The Odin ravens in the tattoo indicate that the king is in full consciousness as he brings down his wrath on whatever subject. Also a modern fabrication, this upper arm tattoo design incorporates a Viking warriors face covered in enemy blood and battlefield dirt. The crooked smile on his face indicates plain bold bravery and the blood on his face represents victory and conquer. This tattoo has Odin’s image in a very intense and intricate design with so much detail it probably tells of the entire Norse mythology. We can make out Odin’s fierce face and his eye patch under a horned helmet. Below his long beard is the mythical hammer of Thor. To his sides are his twin ravens as well as a Viking sword and an ax. Although no record or archeological discovery has proven that there was ever a horned Viking helmet, the tattoo design has quickly resonated with nordic tattoo lovers everywhere. Almost similar to the Aegishjalmur and many Celtic tattoos we feature on our site, this symbol is also made of eight rune staves that meet at the middle almost resembling a modern day compass. Vegvisir is an Icelandic term meaning way finder. According to Norse mythology, the Vegvisir is a magical symbol that helped the bearer find his sailing path amidst bad weather and storms. Cool, right? The Nordic tattoo has today gained popularity as a symbol of protection and guidance and acts as a reminder to the bearer not to lose their focus and purpose in life. The next symbol is a mythical supernatural weapon wielded by Odin’s son Thor. In Norse mythology, the Mjolnir or Thor’s hammer is a symbol of diligent protection strength and power. The Mjolnir is the extension of Thor’s power and command on lightning and thunder. People wearing this symbol are believed to receive the god’s protection, strength, and power. This is yet another Viking tattoos design now showing Ragnar Lothbrok. He was a powerful and very victorious Swedish King who led multiple pirate sail raids on Francia and England. Ragnar was a ruthless voyager and pirate as indicated by the ship below him in the tattoo. This impressively designed symbol is as much a mystery as it is a beauty. Archaeologically discovered on many rune-stones and several burial site carvings the Valknut is an image of three interlocking triangles. Valknut, a Norse word meaning slain warriors knot is believed to have been used in religious burial practices. Since the tattoo is mostly associated with the idea of death it is therefore worn to symbolize and appreciate dead warriors or loved ones. It is also known as the knot of the slain warriors or Hrungnir’s heart. The cloaked Norse god in this nordic tattoo is a representation of unswayed loyalty and determination, acknowledgment of death and healing. One of the most common Viking tattoos is the fierce face of Odin in battle. His hollow white eyes illustrate his mental and battle savagery. While this is technically not a Viking or nordic tattoo per se since it’s of the modern-day Australian actor Travis Fimmel, but we figured we’d include it anyway because the show Vikings is fantastic! Travis plays the famous Viking king Ragnar Lothbrok on the hit TV series on the History channel. Lastly, in this post, we have a creative skull tattoo where the screaming skull is wearing a Viking horned helmet, with its eyes wide open. Then there is the Valkyrie which shows an enormous bear wearing a cut horned helmet breaking out of its chains. This tattoo designs are very gothic and elaborate the bearer’s acknowledgment of his/her mortality. People wearing these Viking tattoos reckon that they will someday pass on and should, therefore, live every day as free-spirited as possible. They represent power over fate. Next articleCan You Get a Tattoo While Pregnant?